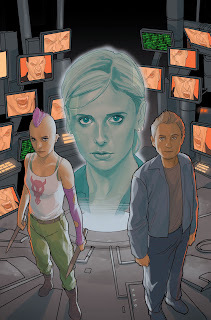 Moving on from the pregnancy plot (and yes it is really and truly over so far as I can tell), Buffy Season 9 begins on the path of a new and very different story arc with issue #8 called “Apart (of me).” I have just one word for you to sum up the surprising direction things are headed, but not just yet. Let’s talk about a few other sundries first. First, the good news. If you’re smart and you figured out how the whole “Buffy is a robot” thing works, then you already know that some of the emotional stuff from last issue still holds. That’s my way of saying that Buffy and Spike’s relationship is still growing and evolving in a way that I find emotionally satisfying. There’s also a solid B plot surrounding the death of Cheung and the emotional fallout from that with a special guest appearance from Xander and Dawn. I’m relieved that the other members of the cast aren’t getting lost in the shuffle. One of the good things about the actual show was that there were always multiple threads coming together all the time and I feel like Season 9 is doing a much better job of that than Season 8 did. That’s the good. The less good news, and I can’t imagine anyone will be surprised if they’ve read the solicits for later issues, is Andrew. Oh, Andrew. Never my favorite, but boy did I not anticipate he’d regress into the sort of dude who could justify taking a woman’s agency away completely. DON’T WORRY, THOUGH BECAUSE HE WAS DOING IT FOR BUFFY’S OWN GOOD. Right. Here’s the narrative flaw for me. I need to believe Andrew would do what he did (and, yes, it’s a little complicated so I’ll leave some of the details for when you read it.) My beef is that I don’t buy that Andrew would take the actions that he has and, furthermore, that Buffy or Spike would allow him to continue, you know, BREATHING after they figured it out. I suppose you could argue he is a necessary evil in this moment but, BOY, am I not loving where his story has gone. Buffy Season 9 #8 is a good but mixed bag, basically. On the one hand, there’s exciting stuff on the horizon and it feels like we’ll be getting interesting character development for more than just Buffy. On the other, I felt like I had to swallow some bitter pills and accept some stuff I didn’t want to in order to focus on the things that are good. Then again, I’ve felt that way since long before the show became a comic so, hand on heart, maybe I’m just that guy, you know? Alright. Back to that one word that is going to describe the rest of “Apart (of me).” Did you work it out while reading reviews on the interwebs? If not, then here it is – Dollhouse. Soak it in because, baby, you don’t know the half of it. Let me know what you thought of this issue in the comments. I liked Andrew, I mean I didn't wanted him dead or something horrible to happen to him. Till reviews for this issue started to go up. But really does he have enough brain and resources to be the single person responsible for this? Couple more hours for me.